Following our previous exhibition appearances, RW Agriculture were presented with the HSBC Cup for 'Best Manufacturers' Stand (Outdoors)' to add to our ever expanding list of accolades. Aided by an impressive multimedia display, the show was a success for both RWA and co-exhibitors Samco and continues to build our reinforce our position in an extremely competetive market. For more information on LAMMA, including a full list of awards and exhibitors and details of next years' show, please visit www.lammashow.co.uk. 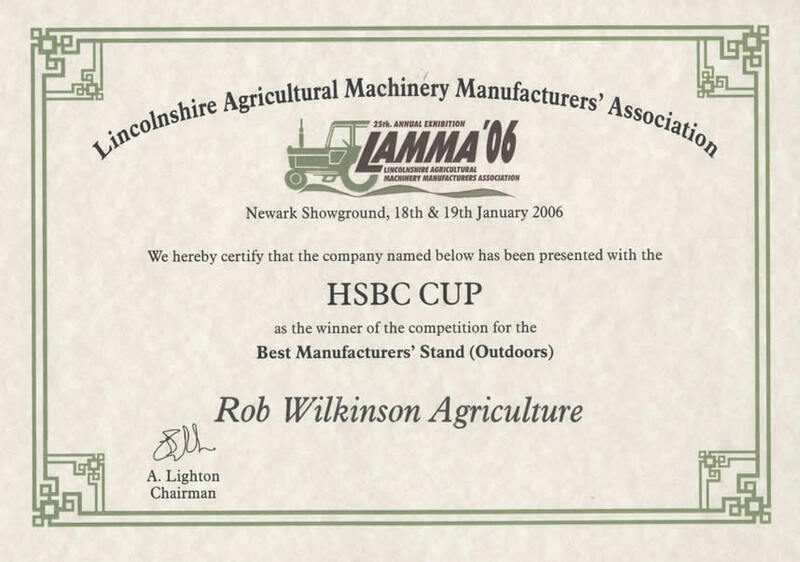 At the 2005 Ashby Show, located in Ashby-de-la-Zouch, Leicestershire, RW Agriculture were pleased to receive their second major award of the show season. Rob Wilkinson, Managing Director received the award with thanks and went on to say 'this award shows our continuing commitment to the industry and the pride we take in our work'. For more details on Ashby Show, including a full list of awards and details of next years show click here. On 23rd June 2005, RW Agricuture were proudly awarded with the 23rd Perpetual Challenge Cup at the 2005 Lincolnshire Show. This prestigious award is given annually to the best stand of the show. Rob Wilkinson, Managing Director and founder, was at hand to receive the award and said 'this years show has been a great success for us and we hope to be back next year'. For more information on the Lincolnshire Show, including details of next years show click here.